Children live in a media-rich world that’s dominantly visual. Media conditions children to focus on rapid-fire visual images. Parents and teachers want to cultivate a multi-sensory awareness. Tuning into sounds helps children acquire the auditory skills needed for literacy as well as appreciate the environmental soundscape around them. But busy schedules and mesmerizing videos often override the simple pleasures of listening. Listening skills are taught through deliberate exposure to the nuanced complexities of sounds in the world – beat, rhythm, and pitch for example. Listening is active and it is selective, filtering out competing sounds while focusing on others. Children acquire tools for listening by identifying and describing sounds. Through listening, children hear more and more. Listening starts with a whisper. “Shhhhhhhhhhh, what do you hear?” “Listen.” Listen to the rain, to the birds, to the leaves chattering from the trees. Listen to the silly words in a Dr. Seuss book. Listen for the letters in your name. Do you hear grandma’s car in the driveway? Take a “listening minute” now and then through the day. Or, take a “sound walk” through the neighborhood and discover things you never noticed before. Listening helps your child pay attention. On a good day, it helps your child to hear and follow your directions. Telling a child “to listen” is like telling a room full of grown-ups not to think of a pink elephant – just won’t work. 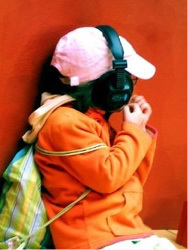 Children learn to listen through games and through the excitement of new auditory worlds. Here are some fun listening games and activities to try with your child. Simon Says: Play “Simon Says” in the car or waiting in store lines. Your child follows your directions as long as you say “Simon Says”. When else does everyone laugh when caught not-listening! Going on Vacation: Parents are intimidated by this game but three-year-olds can remember a sequence of ten items without a problem – and they’ll remember it a week later too. The game is played by listing things to take on vacation and repeating in sequence everyone else’s items. “I’m going on vacation and I’m taking my blue mittens.” Next person says, “I’m going on vacation and I’m taking my toothbrush…and Karen’s blue mittens. Copycat: Your child may love to drive you crazy with this one. Before you can speak, you have to repeat the last thing someone else said. Tuesday might be “copycat” night at the dinner table. Rhyming Words: Sing songs like “Down by the Bay” – “did you ever see a moose kissing a goose” or “a bear combing his hair”? Make up original songs using family names or new words to favorite tunes. Word for a Day: Pick a word for the day – a color word, a number, or “mommy”. Your child collects a sea shell or a sticker every time she hears someone else say the word. Sound Safari: Sound safari is a scavenger hunt for sounds. Write a checklist or paste pictures of familiar sounds from your neighborhood – birds, car horns, baby crying, crickets, dog barking, siren, etc. Go for a walk crossing off the sounds as you hear them. How many days does it take to find them all? Copy the Beat: Sitting in a restaurant waiting for food? Tap out a beat for one another to copy. Name that Food (Sound, Tune, or Instrument): Can you name a food from the sound it makes? Plan tonight’s menu around interesting sounds – something crunchy, slurpy, or maybe fizzy! Change the game by hiding noisy objects under the table and guessing the sound. Or play the first few notes of a song or an instrument. Silly Sentence: Can you say a sentence using the same beginning letter for every word? Busy Bobby broke the baby’s bottle. Or more simply, describe someone using the first letter of their name – kooky Karen likes talking to happy Heather. Music, storytelling and poetry all add more interesting opportunities for listening and sharing through the power of sounds and words. Begin with a simple sound-awareness. Before you know it, your child will have the ability to listen to others, to listen to nature and even to listen to the sounds within. Listening changes the world. Can you hear it?